In 1893 the Otago Golf Club had the honour of staging the inaugural Amateur Championship of New Zealand. This was the second such event in any British Colony. The first was the "Championship of India" just one year earlier. There were fewer than 30 entries and it is part of the Otago Club's heritage that the winner was an Otago Club member, JA Somerville, a new arrival from Scotland and perhaps a player with a little more experience than his opponents. His photograph, taken soon after his historic win, did not include the Amateur Championship Cup because the trophy was not purchased until early the following year. The cost of 16 guineas was shared equally by the Otago, Christchurch, Hutt and North Otago Golf Clubs. On that basis these clubs assumed the right to organise “The Amateur” for some years. Arguments arising from this situation played a large part in the eventual formation of a national controlling body for the sport. 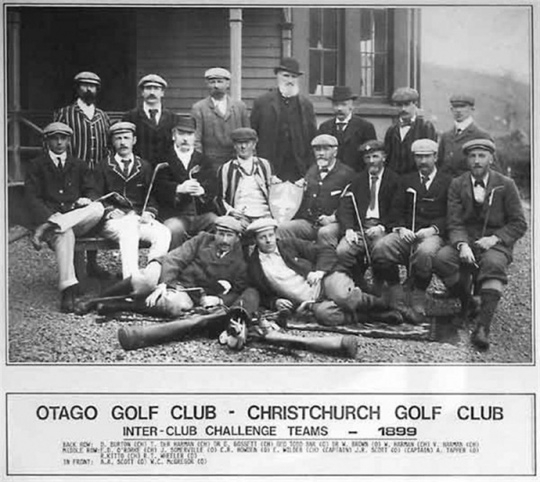 In 1895 the Christchurch and Otago Clubs agreed that it was time for a representative body such as the Golf Council. Since that first Amateur Championship in 1893, the Otago Golf Club has hosted 10 Amateur Championships of NZ and the NZ Open Championship on seven occasions. In 1894 the event was held in Christchurch. Again a member of the Otago Golf Club, H MacNeil was successful. The event returned to Balmacewen in 1896, and once again the Club produced the winner: on this occasion MS Todd. In 1900, ADS Duncan from the Wellington Golf Club won the Championship at Balmacewen and in 1904 AH Fisher, a local member, was the winner, also at Balmacewen. 1908 saw the second NZ Open Championship played at Balmacewen and it was won by JA Clements, Professional to the Wanganui Golf Club. In July, 1873, the Christchurch Golf Club played the Otago Golf Club. It is believed to be one of the oldest interclub golf fixtures outside the British Isles. In 1898 the Secretary of the Christchurch Golf Club, Mr NGW Hanmer, presented a shield for foursome play between the two Clubs. This original trophy was replaced in 1899 when Dr Graham Campbell, Secretary of the Christchurch Club, and Mr JH Hosking, Club Captain of the Otago Club, presented the Campbell-Hosking Shield, which was to be competed for on an annual basis. The rivalry between the two Clubs remains as one of the oldest interclub challenges in the world of golf.